I shook my head automatically as I started to reply, but my wife nodded before I could deny it. Everyone chuckled. That conversation still makes me think. I don’t consider the kind of trekking I do marathon hiking, per se. 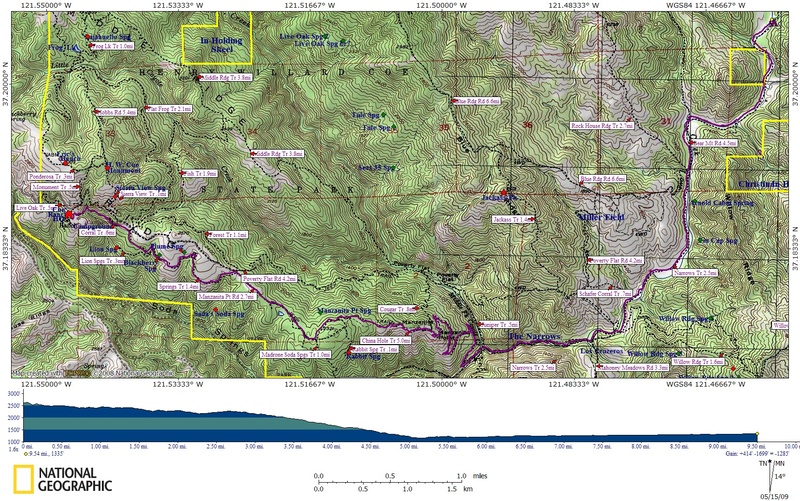 Though my longer excursions may be upwards of 30-50 miles, I rarely hike more than 10-12 miles in a single day. On the other hand, the through hikers that plow through the Appalachian Trail, or the Continental Divide Trail, or the Pacific Crest Trail in a single season routinely hike more than 20 miles per day. And they maintain that pace for months on end. That’s marathon hiking to me, and that’s just plain crazy. But I guess that only proves that crazy is relative. 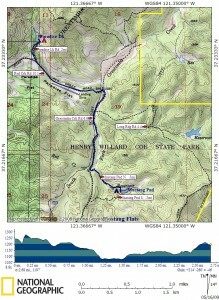 My latest bout with insanity was a 42 mile, solo backpack trip at the end of April. 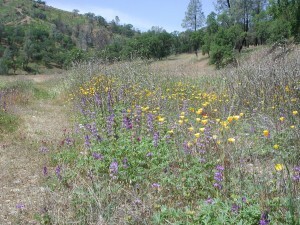 I was returning to enjoy some of Henry Coe State Park’s 87,000 acres of terrain and 400 miles of trails. My first visit was far too short to see everything, so this trek would take me to some of the park’s less accessible sights. Day 1 of my 5 day, 4 night adventure took me through the Western Zone and into the Blue Ridge Zone. As I did on my last hike in Henry Coe, I followed the single track Corral Trail to its junction with Springs Trail 0.6 miles south east of the park headquarters. Then I continued along the pleasantly graded Springs Trail to its junction with Manzanita Point Road at 1.8 miles. Broad and sunny Manzanita Point Road carried me past the Manzanita Point Group Camps and Bass Pond (and a very handsome wild turkey who posed for a photo) before I turned northeast onto China Hole Trail at 2.7 miles. I met one other backpacker on her way out of the park as I descended through 1000 feet of elevation along the chaparral perfumed switchbacks of China Hole Trail. While I sat on the shore of picturesque China Hole for lunch at 5.2 miles, two other backpackers passed through on their way to Los Cruceros camp. This is one of the best parts about Henry Coe. After these three friendly greetings, I didn’t see another human for four days. I literally felt like I had the entire park to myself, and it was glorious. After lunch, I turned my back on China Hole’s inviting swimming holes, and headed into the Narrows, a one mile long meander along the east fork of Coyote Creek. The Narrows doesn’t have a maintained trail, but following the creek’s path through the stone walled valley isn’t challenging, as long as you’re up for a little rock hopping along the way. I turned my feet northward along Coyote Creek after leaving the Narrows, waving to the two backpackers who were setting up their camp for the night at Los Cruceros. 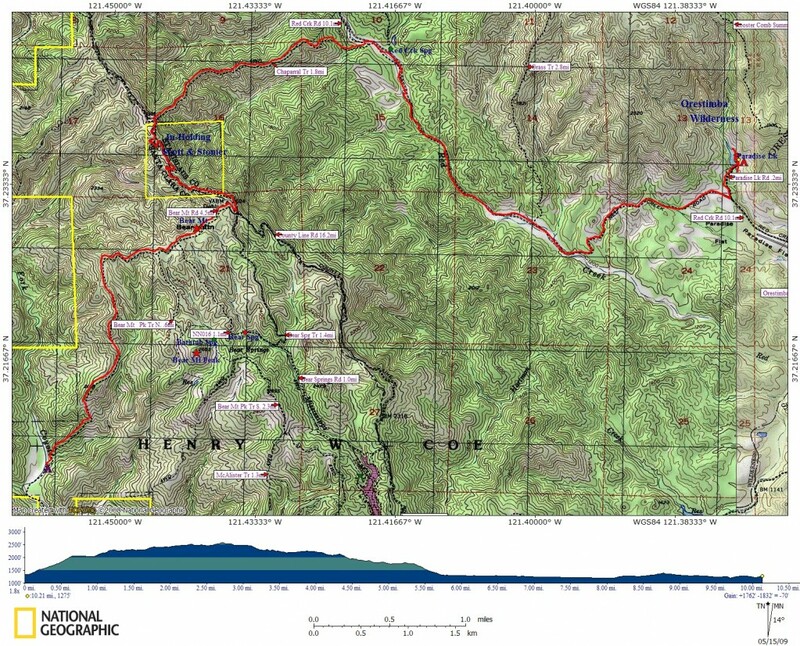 I crossed over into the Blue Ridge Zone at 6.5 miles as I passed the intersection of Narrows and Shafer Corral trails. The rest of my hike for the day was a leisurely stroll along the grassy banks of Coyote Creek. At 8.6 miles I passed the turn-off for Blue Ridge Road and Rock House Canyon Road to the west as I continued northward along Bear Mountain Road. This trail is an old jeep road, which crosses and recrosses Coyote Creek as it wends its way northwest toward Bear Mountain. 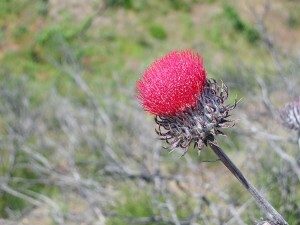 I continued steadily along the dusty gravel path, enjoying the spring wildflower blooms that carpeted the valley floor as I passed turn-offs for Little Long Canyon Road and a couple of private property holdings. 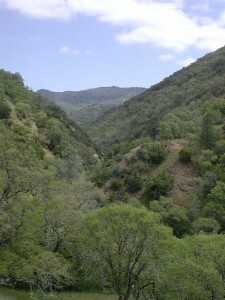 At 10 miles, Bear Mountain Road leaves Coyote Creek and the level valley floor behind as it begins a steep ascent into the park’s Interior Zone. I found a nice level spot near the babbling creek at the foot of the first climb and set up camp for the night. I spent the rest of the evening making notes in my journal and enjoying a tasty dinner. 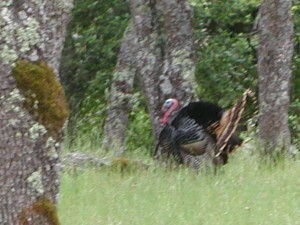 That was Day 1 of my Orestimba Adventure: 10 miles, 1700 feet of elevation loss, 3 hikers, and one tom turkey. 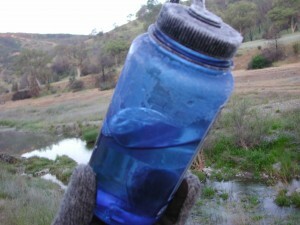 I awoke on Day 2 to find a thick layer of silvery frost on my bivy, and a shelf of ice in my water bottles. The temperature had dipped below freezing for much of the night, and I hadn’t even noticed. After a quick breakfast, I packed up and hit the trail. Unlike the single track trails throughout the park, Bear Mountain Road was graded more for vehicles than for mere mortals. The first ascent of the morning was a grueling 1000 feet in less than a mile. After crossing over into the Interior Zone and attaining the ridge at 1.2 miles (11.2 trip miles), Bear Mountain Road continues northwest toward the 2604 foot summit of its namesake. This entire area is still recovering from the Lick Fire that burned over 47,000 acres in 2007. New tufts of green are sprouting around the charred black branches of chaparral and color is marching its way across the dry hills. There is no shade to be had on this leg of the hike, but the views are unobstructed for miles. So bring your sunglasses, a hat, sunscreen, water, and take plenty of breaks if you decide to make the trip. I reached the summit of Bear Mountain at 2.8 miles (12.8 trip miles), passing Bear Mountain Peak Trail and two branches of Bear Spring Trail that wound south through the Interior Zone toward Mississippi Lake. After the strenuous climb up to the ridge, the summit itself was a bit anticlimactic. But it did mean that I had completed most of my climbing for the day. Just beyond the summit I reached County Line Road, an wide jeep trail that marks the border between Stanislaus and Santa Clara counties, and also the divide between the Pacheco Creek and Coyote Creek watersheds. Here I turned north, which took me through a gated fence at 3 miles (13 trip miles) onto one of the private property carve-outs in the park. If you travel this high ridge, be sure to respect the land owner by sticking to the road and not lingering. Not that I had much choice but to stay on the road. This northern part of the Interior Zone if sliced up by steep sided ridges. County Line Road teeters along a knife-edge, the only viable route for miles around. Again the views are magnificent, but you wouldn’t want to be there too long under a relentless late summer sun, so plan accordingly. At 4.1 miles (14.1 trip miles), just after crossing out of the private property, I turned east at an overturned trail marker, and officially entered the Orestimba Wilderness Zone. The Chaparral Trail, or Old Hayseed Road as I came to think of it, is another unmaintained jeep road, steep and rugged. The chaparral hasn’t grown back after the fires yet, and the trail is filling in with tall, dry grasses. These wild grasses are laden with seedpods eagerly awaiting any opportunity to burrow their pointy way through socks and the linings of hiking boots. 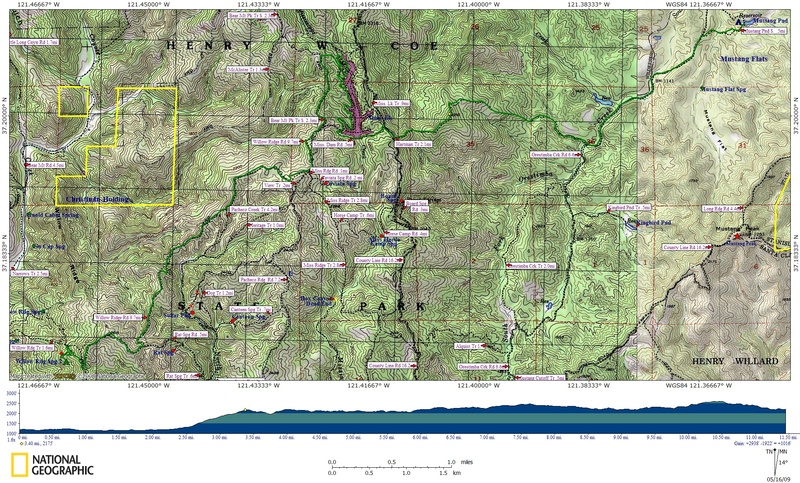 The 1.8 mile long trail descends through 1000 feet into the broad valley of Red Creek. The last half mile features a daunting 20% grade, so tighten up your laces before the final descent. 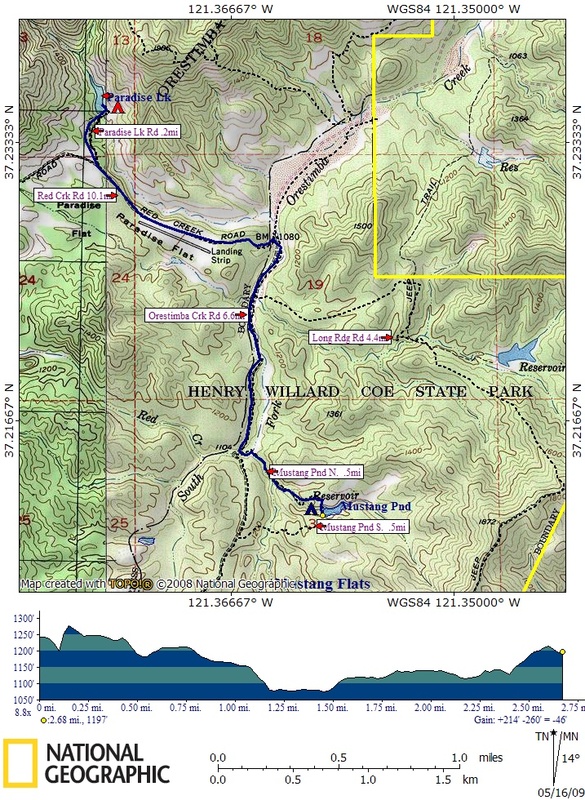 At 6 miles (16 trip miles) I crossed over the dry stream bed of Red Creek onto Red Creek Road. I sat on the creekbank to rest and remove the hayseeds from my socks and shoes. 45 minutes later I finally gave up the effort and turned southeast along Red Creek Road. Like my walk through the Blue Ridge Zone on Day 1, this was a pleasantly level stroll along the floor of a wide river valley carpeted in wild grasses and the occasional burst of wildflower color. But unlike Coyote Creek, Red Creek was mostly dry along this 4 mile stretch. There were still standing pools water to be found stranded near the undercut boulders along the stream bank or sheltering in the partial shade of rocky cliff faces. But running water was scarce. If you’re headed this way, pack accordingly. At 7.8 miles I passed the unmarked Grass Trail to the north. I continued southwest, following Red Creak Road as it veered northeast away from Red Creek and into the low hills at the western end of Paradise Flat. 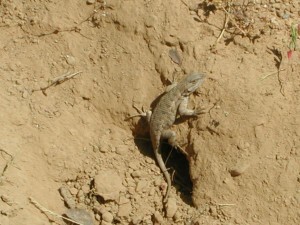 A little lizard was there to greet me, basking in the afternoon sun. This mile long valley is bordered to the north and south by creek beds and was once the site of a airstrip. (I wasn’t able to find any remaining sign of it though.) The valley is a broad sea of rippling golden grains that sway in the breeze like waves, complete with green islands of venerable, wizened oak. Red Creek Road hugs the northern edge of this idyllic savanna. At 9.5 miles (19.5 trip miles) I reached the turn-off for Paradise Lake, a man-made water feature penned into a narrow valley at the southern foot of Robinson Mountain. The lake is tucked into the surrounding mountains such that you can’t see it from anywhere in Paradise Flat. You just turn off Red Creek Road on a dusty trail that winds north into the hills, and scramble down a short but steep descent to find yourself on this gorgeous little piece of… well… of paradise. This was my camp for the night, so I had reached the end of Day 2: 10.2 miles (20.2 trip miles), 1700 feet of elevation gain, 1800 feet of elevation lost, miles of views, and one lizard. Day 3 was a rest day for me. I slept in, swam in the lake, stayed for lunch, and spent several hours working on plot lines and character descriptions for my next writing project. It was a relaxing day, spent in the company of the lake’s resident population of american coots and red-winged blackbirds. But in the interest of making my return trip a little easier, I packed up my camp in the early afternoon and left Paradise Lake behind me. I returned to Red Creek Road and continued east. I reached Orestimba Creek Road at 1.2 miles (21.4 trip miles), where I turned south. 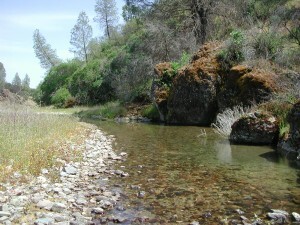 Much like Red Creek, Orestimba Creek was mostly dry, with occasional standing pools of stranded water on the sunny valley floor. At 1.5 miles (21.7 trip miles) I passed a signed turn-off for the Long Ridge Road, which leads east to Jackrabbit Lake. My destination was further south. Unfortunately, the Mustang Pond Trail was not signed or marked in any way. But I did find it, a narrow side canyon with a trickling rivulet of water at 2.2 miles (22.4 trip miles). This route wasn’t so much a trail as it was a wild game path, leading to the dam of Mustang Pond at 2.7 miles (22.9 trip miles). Like Paradise Lake, Mustang Pond is a man made reservoir, with its own captive population of large mouth bass. But where Paradise Lake is surrounded by the steep walled ridges of Mount Robinson, Mustang Pond is cupped in gently rolling hills in the northern part of the Mustang Peak Zone. The banks of the pond are much more accessible, with foot paths all the way around its shoreline. The bass were bigger and much more active while I was camping here than at Paradise Lake, striking the surface regularly to dine on the evening’s bugs. 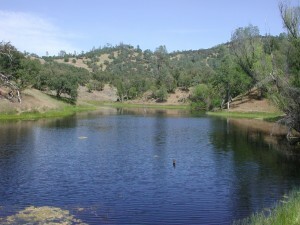 Of the two sites, Mustang Pond is probably the better destination for fishermen. (Too bad I didn’t bring my pole.) But it wasn’t quite as scenic as Paradise. At 2.7 miles (22.9 trip miles), 200 feet of elevation gain and 300 feet of elevation lost, Day 3 wasn’t much of a hike for me. But it put me in a good position for the return trip I had planned. I was up early on Day 4, and had eaten, cleaned up, and broken camp by 7:30. The southern branch of the Mustang Pond Trail was much more open and easy to follow than the northern route. There had clearly been horses through the area recently and someone had left helpful tape flags on tree limbs along the trail to mark the way. 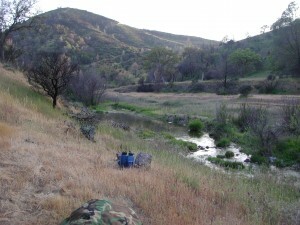 At 0.4 miles (23.3 trip miles) I rejoined the Orestimba Creek Road and continued southwest. The road returned to the banks of Orestimba Creek at 1 mile (23.9 trip miles) and followed the dry gravel of the stream bed to the junction with Hartman Trail at 1.9 miles (24.8 trip miles), where I crossed back into the Orestimba Wilderness Zone. Hartman Trail is not maintained, but wasn’t difficult to follow as it climbed west through the valley of a small tributary of Orestimba Creek. At 2.4 miles (25.3 trip miles) the Hartman Trail leaves the wooded stream bed behind and begins a steep, mile-long ascent through mixed chaparral and chamise. I stopped after climbing through 1000 feet of elevation to reach a small promontory at 2210 feet with excellent views of the Orestimba and Robinson Mountains. Then I pressed on, dropping through a saddle before climbing back up to County Line Road at 4 miles (26.9 trip miles). I followed County Line Road north for 0.1 miles before turning west again into the Mississippi Zone at the road that crosses Mississippi Lake’s dam. The hills surrounding this large man-made lake are lush and green, but water access is limited. I climbed down to the water’s edge near the western end of the dam, where I stopped for a short rest at 4.4 miles (27.3 trip miles). Rather than continue west when I reached the junction with Willow Ridge Road 0.2 miles later, I followed the jeep road that contours along the lake’s western shore. This well traveled, fully wooded road wends northward within constant sight of the lake’s blue waters, but never actually gets down to the shoreline until it reaches a picnic area on the northern cove at 5.7 miles (28.6 trip miles). I stopped at the picnic area to eat lunch, wait out a brief but cooling rain shower, and to refill my water bottles. Then I continued north until I reached an unmarked branch of Bear Mountain Peak Trail, which I ascended to a scenic ridgeline overlooking the entire lake. The rain showers returned during this leg of the trip, but it was a light mist that cooled the air and brought out the fresh smells of chaparral and chamise, so I didn’t mind. I put a raincover on my pack and continued south on the Peak Trail to it’s junction with Willow Ridge Road at 7 miles (29.9 trip miles), where I turned southwest once again. The rain continued throughout the rest of Day 4, which was very agreeable during the hike. Willow Ridge Road and the single track Willow Ridge Trail are sometimes called the roller coaster, and with good reason. The southern section of the Interior Zone is banded with steep ridges, much like the northern section. This jeep road climbs up and down as it traverses a narrow, often knife-edged ridge, with views that stretch forever. Most of the walk is shadeless, and would have been hot and sweaty on a sunny day. But the light rain and the high clouds made for cool, pleasant hiking and views that stretched for miles. I startled a black-tailed deer and shared the road with an inquisitive jack rabbit, passing Caviata Spring Trail, Pacheco Ridge Road, and Pacheco Creek Trail along the way. 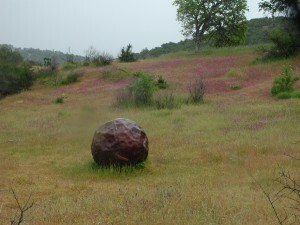 Near the turn-off for Rat Spring Trail at 10.2 miles (33.1 trip miles) I found a curious landmark, a large, worn wrecking ball lying forgotten in a field of wildflowers. Day 5 dawned cool and partly cloudy, but free of rain. I changed back into my wet gear to preserve some dry clothes for the drive home, and broke camp after breakfast. 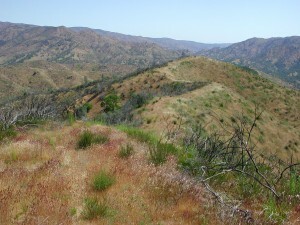 I returned to the Willow Ridge Trail and turned east, descending through alternating black oak and chaparral. The single track trail descends through switchbacks across former ranch lands, losing 1000 feet of elevation in a little over a mile on its way to Los Cruceros at 1.7 miles (36.2 trip miles). Back on familiar ground again, I crossed through the Narrows to China Hole. But instead of returning up China Hole Trail, I turned southwest down Coyote Creek on the Mile Trail. 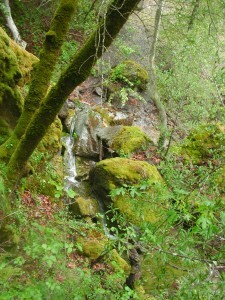 This densely forested single track trail follows the Soda Springs tributary of Coyote Creek west from China Hole. I crossed and recrossed the merrily flowing stream several times along the Mile Trail, passing a thick stone walled root cellar set into the hillside on the northern edge of the stream and a collapsed hunting lodge straddling the stream just before reaching the Madrone Soda Springs trail camp at 4 miles (38.5 trip miles). Here I turned north onto the Madrone Soda Springs Trail, which ascends 800 feet up a steep ridge through switchbacks. I stopped for lunch at the Manzanita Point Group Camps at 5 miles (39.5 trip miles) where I ran into the first campers I had seen in four days. I lost count of the day hikers and wild flower viewers I ran into on this final leg of the trip. After lunch I continued northwest along Manzanita Point Road to its intersection with the shaded Forest Trail at 5.7 miles (40.2 trip miles). This contour hugging single track trail is a pleasant alternative to the sunny Manzanita Point Road and took me back to the Corral Trail at 6.9 miles (41.4 trip miles). I ended Day 5 back at park headquarters: 7.5 miles (42 trip miles), 1900 feet of elevation gain, 1400 feet of elevation lost, and a return to civilization. This trek was a wonderful escape for me, and a great return to nature for a few days. But it was definitely strenuous, and not for the faint of heart or the out of shape. 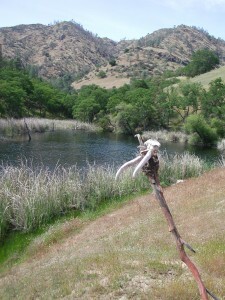 There are many ways to enjoy Henry Coe State Park. If you live in the Bay area, I invite you to plan a trip as soon as you can get away. Go ahead, find your own wild side. The text of this article was previously published on Associated Content. You seem like quite the adventurous type! I’m always amazed by the stories of those capable of things I’m not. The image of the lake is beautiful, too. Enjoy the hiking! Kristyn – Hiking never really seems that adventurous to me, but then again I try to do it on a regular basis. I was pretty happy with some of the pictures from this trip. I’m glad you enjoyed them. There’s a panoramic shot of Paradise Lake that I didn’t included here posted with the Associated Content article if you want to check that out. Cheers!